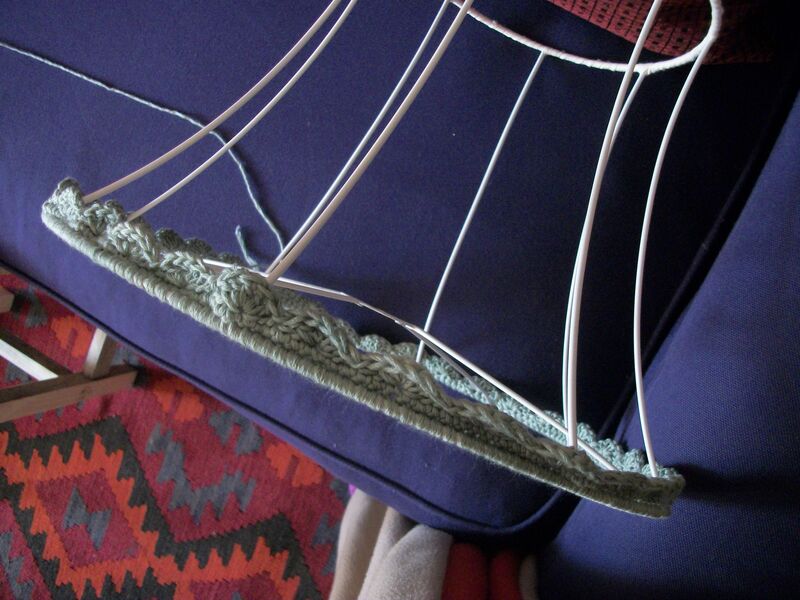 Looking for a quick and easy project when everything else you’ve been working on seems to be going seriously wrong or you lose interest or is clearly not viable or the cat vomits hairballs on it? Yes, I was, too. 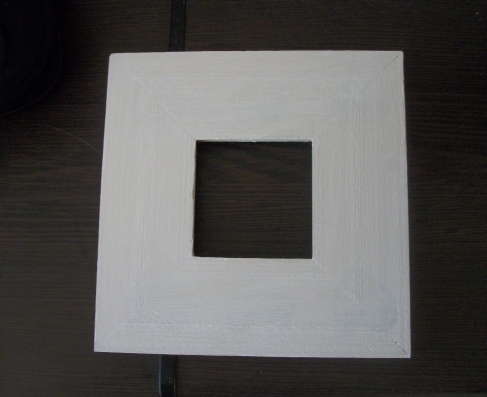 Take a plain wooden frame. Paint it with white acrylic paint. 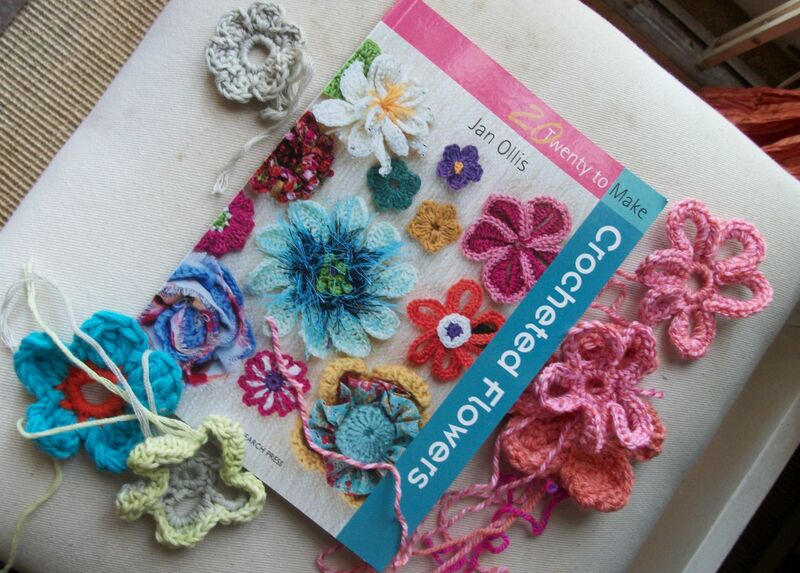 Crochet some flowers. 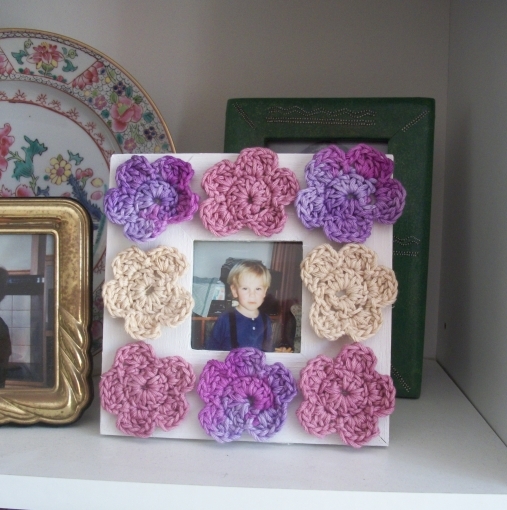 (I got my pattern from Little Birdie Secrets, they also have other lovely stuff). 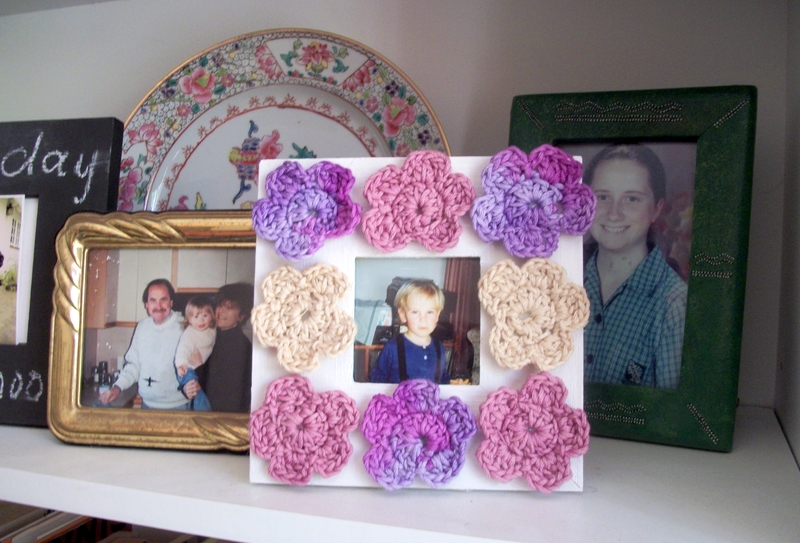 Stick the flowers on the frame (by the time you’ve made enough, the paint will be dry). Insert photo. Take a pic. Show and tell. Feel sense of achievement. Acknowledge that this project is very similar to the recent wreath thingie, but perhaps no-one will mind? 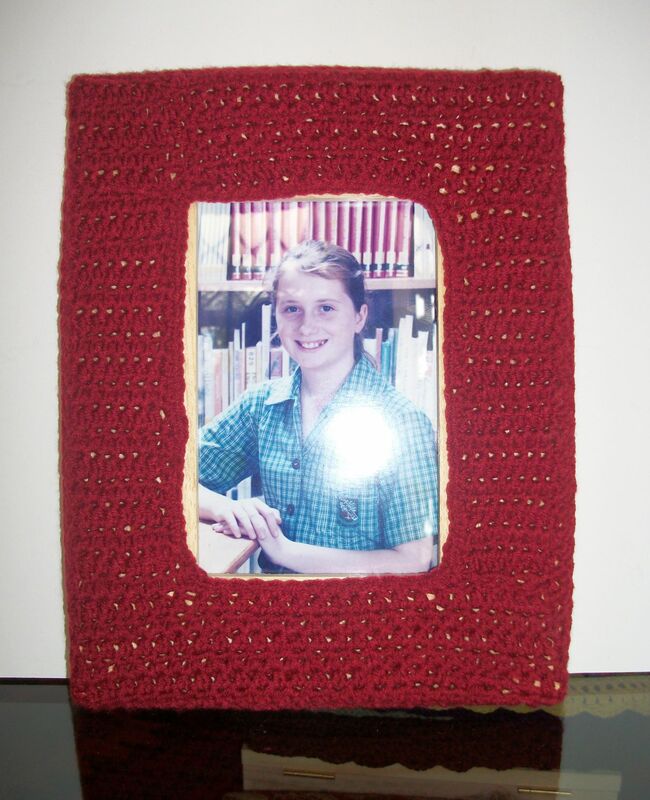 This entry was posted in cotton, Craft, Crochet, frame, handmade and tagged colour, cotton, craft, crochet, diy, flowers, frame on February 12, 2013 by Nice Piece of Work. 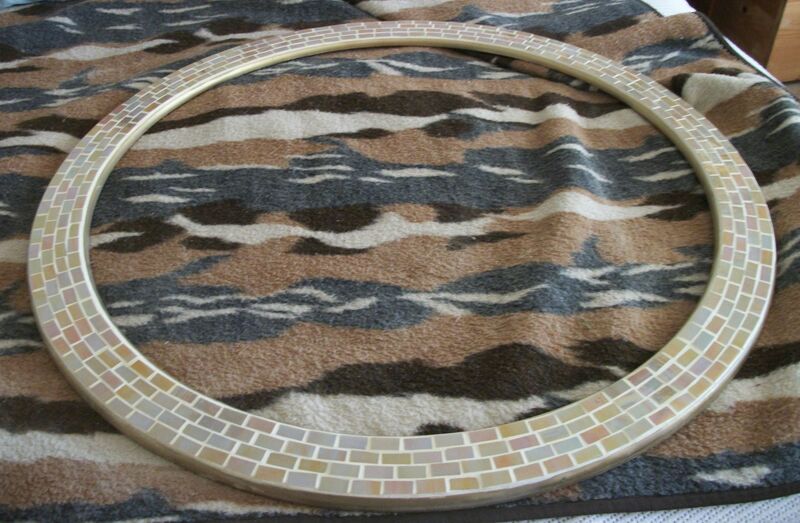 I finished the big round mosaic frame this week and delivered it to Anne (not my Jam Tarts Anne, another Anne). Anne is an ex-colleague and works where I used to work full-time, at a large software developer in Newlands. The company has a pretty big staff complement, many of whom are my facebook friends so we can keep up with each other’s news. Delivering the frame to Anne meant that I bumped into loads of people I have only seen online in the last few months, and guess what – It’s much nicer to see them in real life! Ok, that’s it from me today. 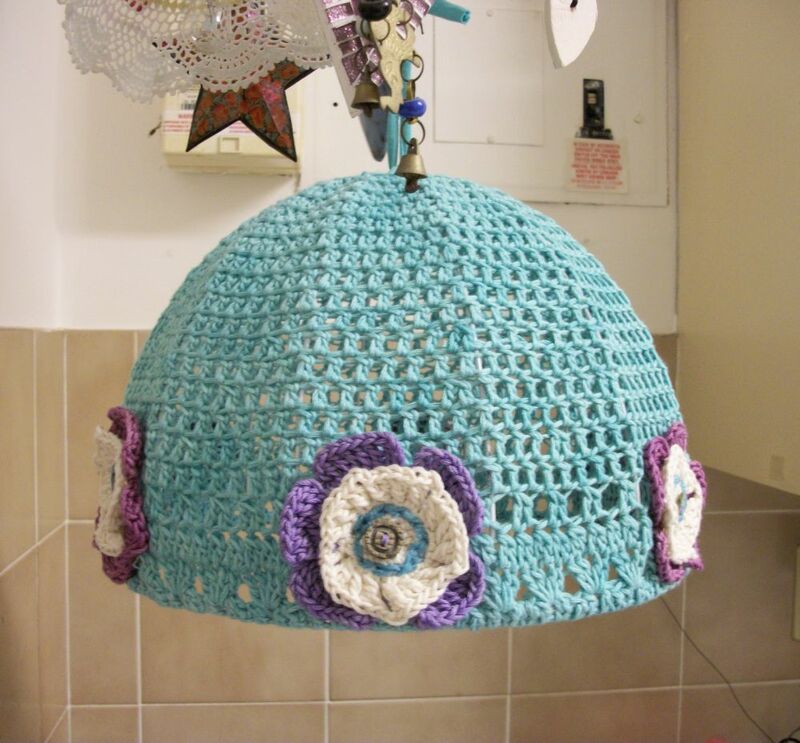 I still have lots and lots to do for tomorrow’s market at Rondebosch Park. Please keep your fingers crossed that everyone likes our stuff :-) also that I remember to pack all the pieces for the gazebo! This entry was posted in Craft, frame, friends, handmade, market, Mosaic, Rondebosch and tagged frame, market, mosaic, Rondebosch Park on September 7, 2012 by Nice Piece of Work. Those selfish animals of mine forced me to get out of bed just before 5h00 this morning. Jessie starts a sort of wild ride on one of my hips, which is a bit odd but not terrible, but Choco has started reaching up next to my bed and swatting my face. It’s not nice to be woken up that way, especially when it’s dark and cold. Anyway, as I trudged down the passage to feed the vermin and get my coffee going, it struck me that I could turn this into a positive thing: since I was up, I may as well use the time to get going with my day and tackle the Big Item on my list – tidying the lounge. I have a friend coming for tea tomorrow and there is no way I can let her into the flat the way it is now. Literally or figuratively. 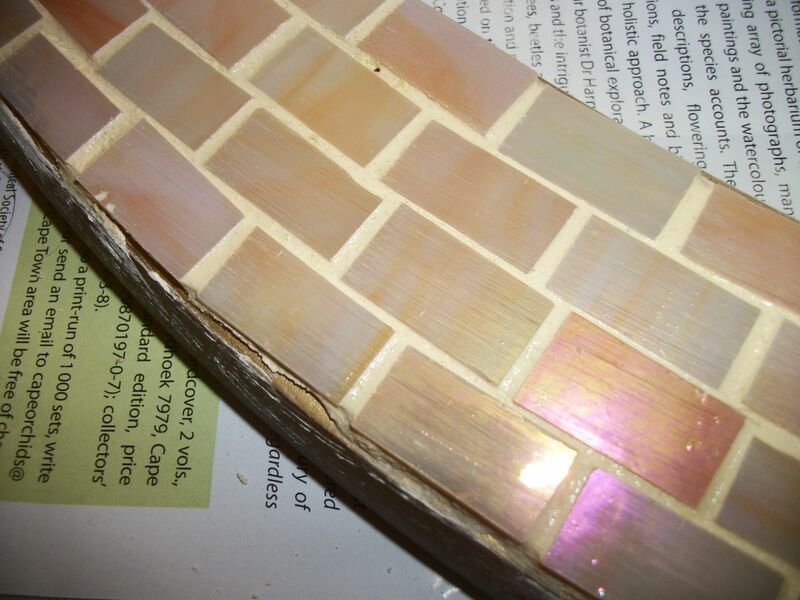 I chose iridescent glass in shades of mother-of-pearl through to a soft peachy shade. It picks up the light in different ways, and looks amazing. Right, enough of that, I’m off to continue with my resolution. 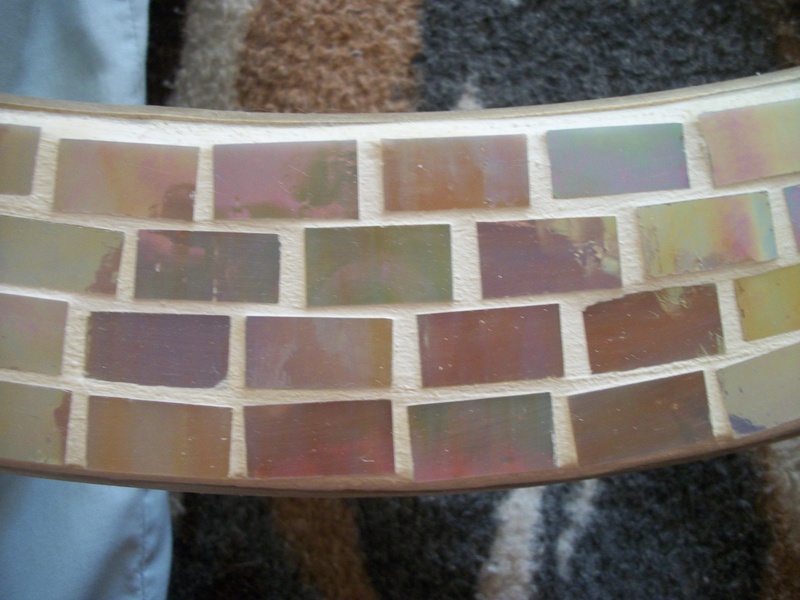 This entry was posted in frame, grout, Mosaic and tagged cats, craft, mosaic on September 3, 2012 by Nice Piece of Work. 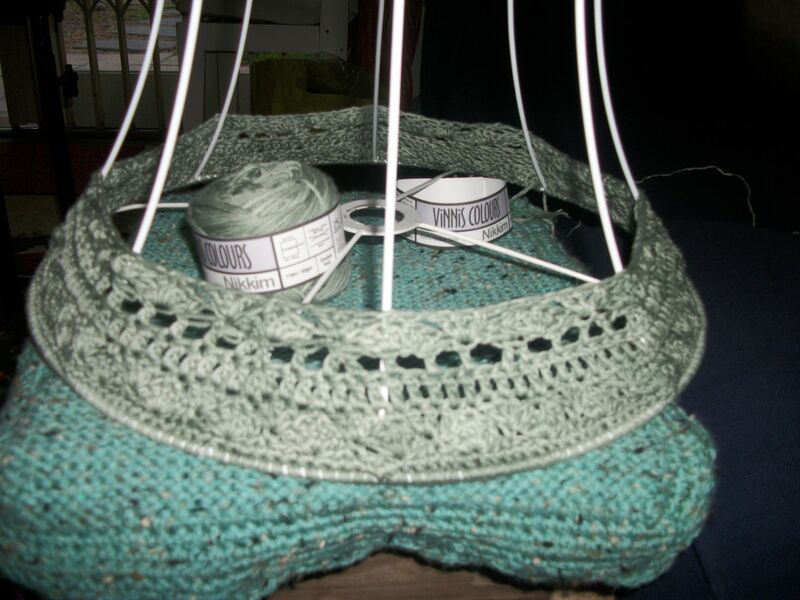 You’ll remember how I recently raved on about Solveig in Norway and her wonderful crochet ideas? 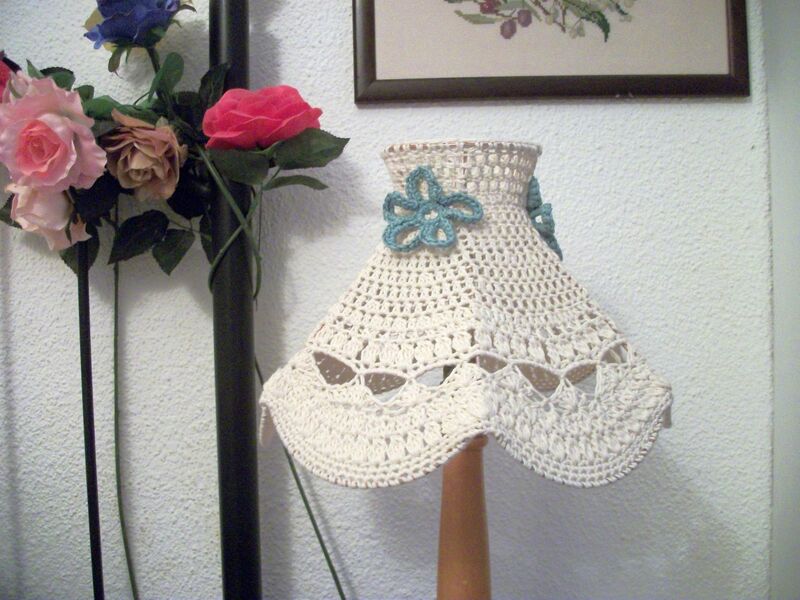 I was eager to make a lampshade like she does, using an old frame and a shell stitch pattern. 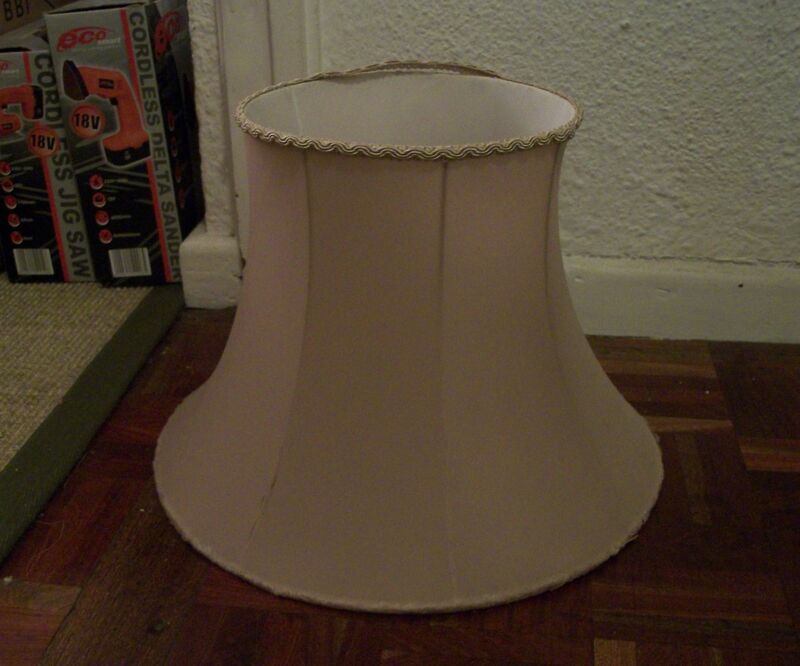 I’ve covered a lampshade before, but I made the cover separately and then fitted it on afterwards. It seemed to work well, but I thought perhaps Solveig’s method would work just as well, if not better, and be more professional. It occurred to me that it might occasionally be awkward to work directly onto the frame, but I figured if she could do it, so could I. 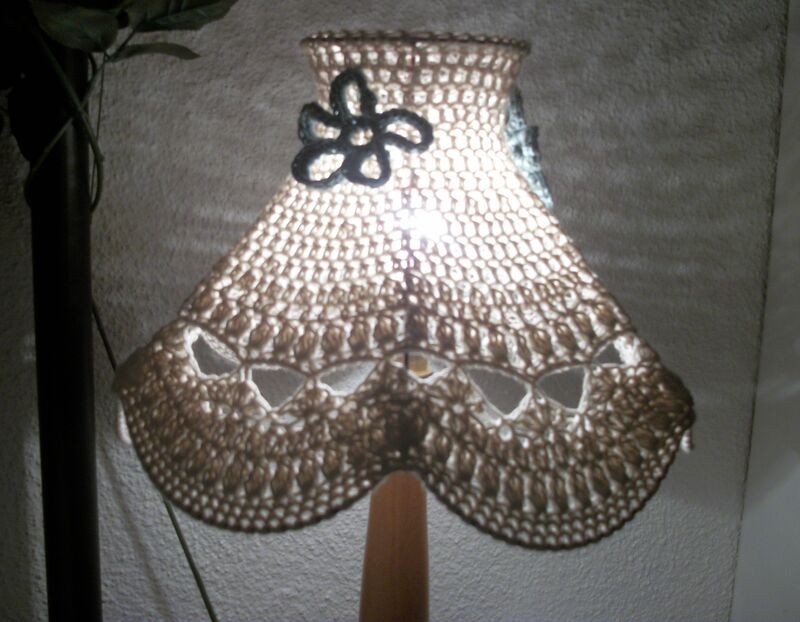 This entry was posted in Craft, Crochet, frame, lampshade and tagged cotton, crochet, upcycling on July 14, 2012 by Nice Piece of Work.